Food lovers and green thumbs alike are often shocked to hear that there are a multitude of flowers that can be grown quickly and easily – and then eaten! While you wouldn’t want to make a meal of these beautiful blooms, they are often the perfect garnish for baked goods and can add a wonderful splash of creativity to salads. Petals can also be used to top off drinks, add some interest to a jelly mould and even be frozen into ice cubes as a sweet surprise. 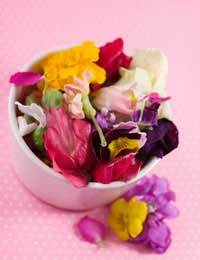 With so many uses for edible flowers, it seems crazy not to at least try them! Ancient Romans used to cook with roses, to the point that some Romans worried that their farmers would get too wrapped up in their flowers and forget about their other harvests, and Middle Eastern cooking in particular has long acknowledged the extra edge that cooking with roses gives to food and drink. Rosewater and rose petal jam are common condiments made with fresh roses. Sugared rose petals can also decorate most cakes and pastries. Rose hip jelly and rose hip syrup may also be used in a variety of dishes. However, if you begin to experiment with rose petals in your dishes, remember to ban any petals that have been treated with pesticides from your kitchen. Many modern individuals roll their eyes at the thought of ingesting or imbibing violets, perhaps because grandmothers around the world seem to always have a faint whiff of this flower on them. Put this stereotype to rest. Violets can be just as exciting as any other edible flower and they are highly versatile. The Ancient Greeks used to combine wine and violets for a pleasant drink, and the deep purple petals of this flower are perfect for adding drama to chocolate dishes. Violet tea is thought to aid digestion and has even been used for medical purposes throughout history, hence the violet throat lozenges and cough drops that still seem to proliferate. Candied violets and violet water can also add some interest to otherwise plain confections. Again, before working with violets in the kitchen make sure that they have not been sprayed with pesticides. Daisies, sometimes considered a rather plain flower itself, can lend a wonderful air of simplicity to rustic dishes. Many budding bakers find that Shasta daisies perfectly complement summer treats, particularly white cakes with lighter frostings, and therefore often make an appearance at young children’s birthday parties. Daisy chains can also garnish cakes and tables alike, and a large bowl filled with Shasta daisy blooms can be a wonderful talking point – particularly if you offer guests a little nibble. Just make sure that all petals are pesticide free before using them in any way, shape or form in your cooking. In addition to roses, violets and daisies there are many other edible flowers out there, including lilacs, sunflowers, pansies, pot marigolds, nasturtium, day lily, gardenia, jasmine, squash blossom and much, much more. Before ingesting flowers, however, make sure that you are correctly identifying the blooms (especially given that other plants and flowers can be poisonous to humans if consumed) and that the flowers have never been sprayed with pesticides. Using published recipes the first couple of times you use edible flowers in your cooking should also help to ensure that you get the delicate balances right. Enjoy!